Before you can read your water meter, you must locate the meter. Most meters are located at the edge of your property line near the street. 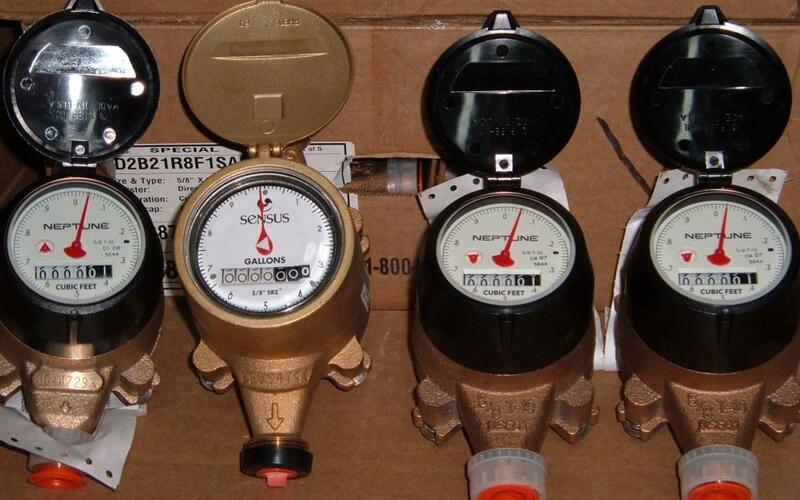 In some areas that are far from a water main, your meter may be located some distance from your house, and in those cases the District can help you identify where your water meter is located. Your meter is read by reading the white odometer dials on the meter face. The last two numbers on the meter are not read when the District reads your meter, but can be used by you in determining your water usage. Most meters read in cubic feet, and it will tell you the measurement type on the meter face (cubic feet or gallons), so one sweep of the dial all the way around the meter face equals 1 cubic foot of water, or 7.48 gallons of water. The small red triangle on the meter face, or the white/red triangle or pronged wheel at the center of the red sweep handle is a leak indicator - if any water is moving through the meter, the triangle will be turning. If everything in your house is off, and that triangle is moving, you either have a leak somewhere that you can't see (possibly underground between your house and the meter), or you have something inside your house leaking water slow enough that you may not notice - from a toilet, for example. You can get a regular idea of your water usage by writing down your meter reading (including the black dials) on one day, and then writing down the numbers at another time - say, the next day - and subtracting the smaller number from the bigger number. That will give you the total cubic feet that has gone through your meter, and if you multiply that number by 7.48 you will get the total gallons you used between readings. For example, the picture above reads 0000 in the white dials and 01 in the black dials. If you wrote this reading down, and checked it the next day, and the meter read 0000 in the white dials and 26 in the black dials, that would mean you used 25 cubic feet during that day, or 187 gallons of water (25 x 7.48). Using this method, you can compare the water consumption in your house for various water devices - washing machines, taking a shower, watering the lawn, etc - and get a fairly accurate picture of how much water each function uses.